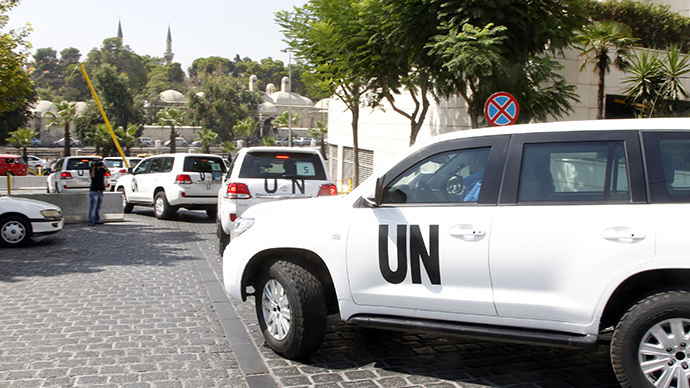 A UN inspection team vehicle in Syria has been shot at by snipers, a UN spokesman says. The team returned to the government checkpoint to replace the damaged vehicle, and is currently meeting the victims of the attack and taking samples. The inspectors’ car “was deliberately shot at multiple times by unidentified snipers in the buffer zone area," the spokesman for the UN secretary-general, Martin Nesirky, said. Despite earlier reports that the inspection will be suspended, the team went to the inspection area after replacing the vehicle, which is no longer serviceable, at the checkpoint. The inspectors are now meeting the victims of the attack and taking samples, medics said. Syrian state TV has issued a statement accusing rebel fighters of carrying out the attack, quoting Syrian information ministry.